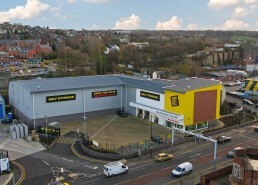 We have extensive experience of building self-storage facilities throughout the country and have worked with Big Yellow, the leading name in the UK, on several of their new sites. They have pioneered the development of the latest generation of self-storage facilities. Work on this particular project in Sheffield started in January 2009 and we were completed by July. We were tasked with the design and build of the steel structure incorporating a distinctive curved roof.